Schott Zwiesel has over 140 year experience of innovation and success. It is independently recognised as the global market leader for the supply of crystal glass into the world’s top hotels and restaurants. As leaders in high-quality glass, the Tritan® crystal glass collections combine functional long lasting design with durability and brilliance. Schott Zwiesel offer not just quality but also depth and breadth of range to meet any requirement. 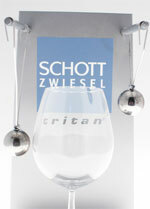 Tritan® crystal glass is a unique, internationally patented crystal glass, invented by Schott Zwiesel. It is completely lead and barium free; using instead oxides of titanium and zirconium. It has a high temperature production process that includes tempering. Tritan’s composition is exclusive to Schott Zwiesel and delivers a superior crystal glass in aesthetics, design and durability. Tritan® crystal glass is the only crystal glass with an eco-profile. It is certified to ISO 9001:2008 and ISO 14001:2004 (which relate to the development, production, decoration and distribution of machine made crystal glass) as well as ISO 14040:2009and ISO 14044:2006, which certify both the factory, method of production and the product have an eco-profile. What are the benefits of using tritan® crystal glassware? Continuously revised and improved with the TÜV Rheinland (technical inspection agency of the Rhineland), the internationally patented Tritan® Crystal Glass is the glass with an ecological profile. Schott Zwiesel is concerned about protecting the natural environment and sustainability and therefore consumes as few resources as possible, by ensuring the optimum use of energy resources. Schott Zwiesel’s certified environmental management system makes sure this is adhered to and tracked using sustainable ecological balance sheets. Schott Zwiesel is continually reducing its carbon footprint through re-evaluation and restructuring. For example in 2012 a project to convert all furnaces to oxy-fuel systems was complete that will cut gas consumption and omissions by c30%. 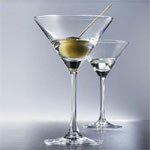 From a design standpoint tritan® crystal glasses are both durable and shatter resistant. This durability comes from the unique composition of tritan crystal and is further enhanced by tempering at the rim, where the bowl joins the stem and where the stem joins the foot. Where the tritan protect system is employed, the entire stem is also chemically tempered to double its strength. This general durability coupled with superlative design, explains why Schott Zwiesel glassware is so popular. The glassware is resistant to chipping, breaking and corrosion. It has the highest dishwasher resistance ratings. Schott Zwiesel has conducted numerous tests, both in house and independently, to ensure the glasses are dishwasher resistant. Even after an astonishing 3,000 domestic dishwasher cycles, tritan crystal remains unmarked with no cloudiness, scratching or loss of brilliance. Tritan® crystal glasses are both practical and functional. The crystal composition is the hardest most brilliant crystal glass in the world, with a diamond like brilliance. These qualities are especially important for the catering professionals: wine-makers, wine experts, sommeliers, restaurateurs, hoteliers and gourmets. It is why so many of the World’s top wine competitions and shows use Schott Zwiesel stemware for tasting. Which means in turn tritan crystal is ideal for use in the home. These specially crafted glasses enable easier handling and cleaning, while enhancing the pleasure of drinking with their brilliance, good design and elegance. Are Schott Zwiesel tritan® crystal glasses worth the money? Schott Zwiesel Tritan® crystal glass offers unequalled quality, durability and brilliance. Each item is monitored to guarantee the highest quality for customers. Tritan® crystal glasses are the glasses of choice among professionals. Tritan® crystal has usability, aesthetics, wine and bar expertise and is ecologically sound. 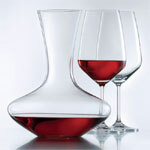 Schott Zwiesel is renowned for its perfection and continues to produce ranges which surpass expectations. All products are completely lead and barium free. Considered by many to be the best crystal glassware available. You cannot put a price on high-quality, longer lasting glassware!